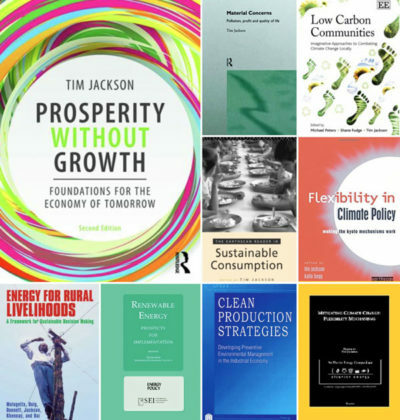 In addition to his ground-breaking work in Material Concerns (1996) and Prosperity Without Growth (2009/2017), Tim Jackson has worked on a number of edited collections. A list of his books can be accessed below. Costanza R, Alperovitz G, Daly H, Farley J, Franco C, Jackson T, Kubiszewski I, Schor J, Victor P. 2013: Building a Sustainable and Desirable Economy –in-Society- in-Nature. ANU E Press, Caberra, Australia. Peters, M, S Fudge and T Jackson (eds) 2010. Low carbon communities: imaginative approaches to combating climate change locally. Cheltenham: Edward Elgar. Jackson, T 2009. Prosperity without Growth – Economics for a Finite Planet. London: Earthscan. Jackson, T (ed) 2006. Earthscan Reader in Sustainable Consumption. London: Earthscan. Mulugetta, Y, Doig A and T Jackson 2006. Energy for Rural Livelihoods: a framework for sustainable decision-making, London, ITDG Publishers. Jackson, T (ed) 2001. Mitigating Climate Change: the flexibility mechanisms, Elsevier Science, Oxford. Jackson, T, K Begg and S Parkinson 2001. Flexibility in Climate Policy – making the Kyoto Mechanisms work, Earthscan, London. Jackson, T 1997. Power in balance – energy challenges for the 21st century, Friends of the Earth, London. 176pp. Jackson, T 1996. Material Concerns – pollution profit and quality of life, Routledge, London, 218pp. Jackson, T (ed) 1993. Clean Production Strategies – developing preventive environmental management in the industrial economy, Lewis Publishers, Boca Raton, Fl., 415pp. Jackson, T (ed) 1993. Renewable Energy: prospects for implementation, Butterworth-Heinemann, Oxford, 272pp. Jackson, T 1992. Efficiency without Tears: no regrets energy policy to combat climate change, Friends of the Earth, London, 82pp.